I can’t tell you how many jobs we have come in because people have tried do-it-yourself leather products that didn’t work out. I hate that. While I can’t speak for other company’s products, I can give you some good tips on what to look for. 1. Make sure the product you are using is designed specifically for the type of leather you are using it on. There are a ton of different types of leather out there. Think about it – some leather looks shiny and some looks more like suede. They soak up products differently, and not all leather cleaners will work for all kinds of leather. 2. Keep in mind that the finish on upholstery leather is completely different from the finish used in jackets, shoes and purses. 3. We don’t recommend products that are supposed to be used on both leather and plastic. You’ll find a lot of these in the auto industry, and these cleaners often cause long-term damage to your leather, and you might not know it right away. 4. 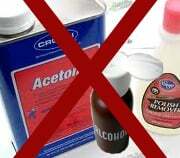 Check the ingredients in your cleaner and be sure that there is NO acetone or alcohol. 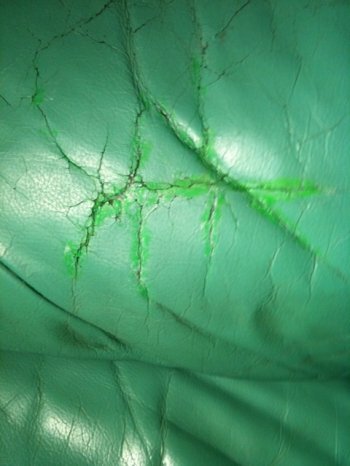 Acetone will remove the dye from your leather, and alcohol will break down its protective top coat. 5.Be wary of do-it-yourself dying products. Finding an exact color match is sometimes difficult for professionals, and most DIY dye kits are going to lack what you need to make your repair look good. Ever tried any products that you had a lot of success or, hopefully not, a huge disaster with? Post experiences, tips and questions in the comments!